A couple of weeks ago, I wrote about our new analysis of Medicaid behavioral health carve-outs. These primary “horizontal” carve-outs are on the decline in Medicaid – nine states have primary carve-outs to care management organizations (CMOs) compared to 13 states in 2011. This change is driven by a policy preference for “integration” and “whole person care” models (see Do States Still Have Medicaid Behavioral Health Carve-Outs?). Nine state Medicaid plans have vertical carve-outs in 2019 – up from eight states in 2016. There are 702,372 Medicaid beneficiaries, representing 0.9% of the total Medicaid beneficiaries, in vertical carve-out models of care. This is obviously a very small proportion, but up 44% from 2016. Of these 702,372 Medicaid consumers in vertical carve-out models, most (42%) are in health plans for individual with SMI. In addition, 36% were in health plans for children with special needs, 20% were in plans serving the child welfare population, and 3% were in plans serving individuals with HIV/AIDS. This trend in Medicaid parallels the use of vertical carve-outs in Medicare Advantage market via the institutional, chronic condition, and dual eligible special needs plans (SNPs). In 2017, the 2.5 million Medicare beneficiaries served by SNPs accounted for 12.3% of the total 20.4 million Medicare Advantage enrollees, and 4% of the total 58.9 million Medicare beneficiaries. While the numbers seem small, this is an increase of 92% between 2010 and 2017. Dual eligibles are the predominant group participating in SNPs, representing 83% of the total population, while individuals with chronic conditions represent 14% of the population, and individuals in institutions represent 3% of the population (see Medicare Specialty Vertical Carve-Out Plans: The 2018 OPEN MINDS Medicare SNP Market Share Report). Looking back at Medicaid, the big story is not just the rise in the number of people in vertical carve-outs, but the use of vertical carve-outs for population with intellectual and developmental disabilities (I/DD). The first state Medicaid plan to use the vertical carve-out model for the I/DD population is Arkansas (see Arkansas Medicaid To Launch Full-Risk Phase Of Medicaid Shared Savings Program In March 2019). The Arkansas program provides a specialty health plan (which is comprised of health plans and provider organizations) for individuals with both I/DD and SMI. In addition, three states—Arizona, North Carolina, and New York—are all preparing to launch vertical carve-out plans for the I/DD population in the next couple of years (see Arizona Issues RFP For Managed Care Plans For Individuals With Developmental Disabilities, New York To Implement Managed Care For People Receiving I/DD Services, North Carolina Medicaid Selects Five Health Plans-One Regional & Four Statewide). These developments signal a desire by state Medicaid plans to find new, but integrated, approaches to managing care for complex populations including the I/DD population. And as Medicaid changes its policy, health plans are creating new models in response. In 2015, Centene acquired Lifeshare, using it as the platform for community-based solutions for people with I/DD. Early in 2018, Optum announced a new initiative related to self-direction and informed decision making for the I/DD population (see Optum Launches Initiative To Improve Self-Direction & Informed Decision Making For People With I/DD). And, in January 2019, Aetna launched a new care coordination model for consumers with I/DD in Kansas with the idea that the model will be scalable (see Aetna Medicaid Launches New Service Coordination Model). From a strategy perspective for specialty provider organizations, my colleague and OPEN MINDS Chief Executive Officer, Monica E. Oss, spoke about how this trend for integrated, risk-based models is changing the market position for specialty provider organization in her closing keynote presentation at The 2019 OPEN MINDS Performance Institute, Fit For Growth – Performance Management & The Growth Imperative. 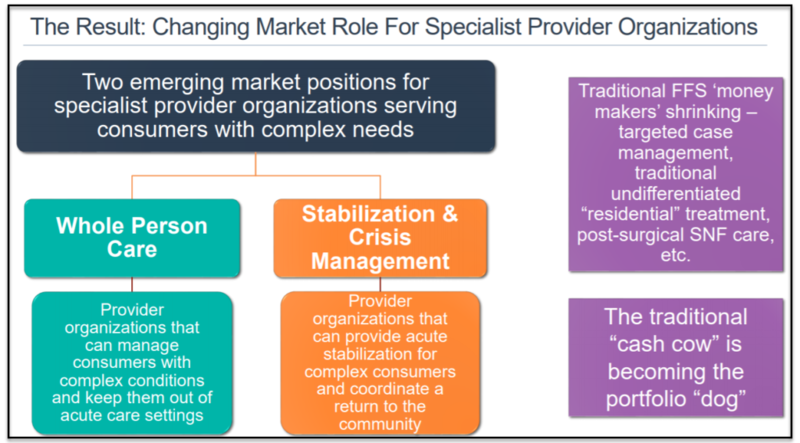 Executive teams of specialty provider organizations need to think about either participating in ‘”whole person” care initiatives including providing specialty primary care – or scalable specialty programs that provide high-end, time-limited acute response. For more on the emerging vertical carve-out market, check out our new market intelligence report, The Medicaid Vertical Carve-Out Landscape: The 2019 OPEN MINDS Update. This report provides a deep dive on a state-by-state basis into the nine state Medicaid plans with vertical carve-out models. In addition, the report contains a list of health insurers operating vertical consumer-specific specialty carve-outs in 2019 and their enrollment. And for even more, join us in New Orleans on June 3, 2019 for The 2019 I/DD Executive Summit. The summit’s keynote, “From Managed Care Planning To Execution – The Future Of Financing & Service Delivery Models For The I/DD Market,” will feature Josh Boynton, Vice President, Aetna Medicaid.